Inside Inner Code programme, curated by Luca Carradori and Chiara Ruberti, the presentation of the newest book Generazione Critica. Arte, fotografia, tecnica (2016. Danilo Montanari Editore), is part of a wider creation of a space devoted to contemporary photography, priviledge moment for discussion on the medium as a tool for creativity and the necessary relationship it entagles with new technology. Generazione critica, this year at its foutfh edition, is a programme born with the aim of deeply introduce and suggest specific topic and focus on contemporary art critic practice, analyzing last decade photography in depth, fostering the debate and ideas exchange. One workshop and a canvas reflect each year on a different topic and a final publication by Danilo Montanari Editore collects all the final essays by the chosen lectures. In line with the sperimental and research features of Generazione critica, the book Generazione Critica. Arte, Fotografia e Tecnicasuggests a punctual analysis on how artists and XXI century art are relating to new media. Post-photography, narrative, regeneration and a possible new esthetic are some of the key words around which the book is built up, combining both the cultural environment artists live and, at the same time, contribute to create. Generazione Critica #3. 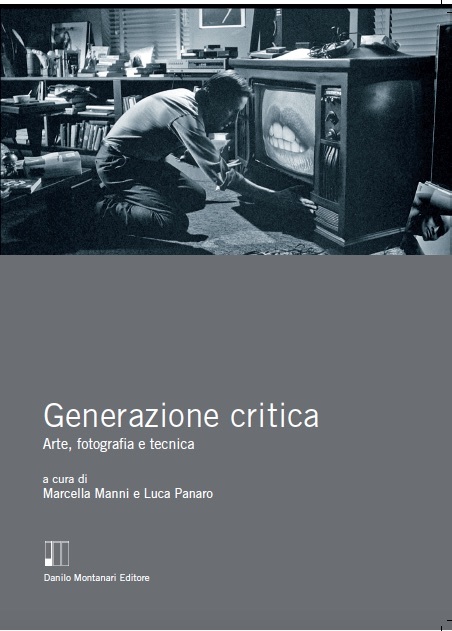 Arte, Fotografia e Tecnica (2016) is curated by Marcella Manni and Luca Panaro, published by Danilo Montanari Editore. Marcella Manni (Modena, 1972) from 2008 she has been curating Metronom activities in Modena, following specific projects devoted to contemporary visual culture, with a specific focus on photography. She collaborates with cultural organizations and Modena Municipality, promoting research activities and workshop on the philosophical application to contemporary art. Luca Panaro (Florence, 1975) is an art critic and curator. Professor at Academy of Fine Arts in Brera (Milano). Among his books: L’occultamento dell’autore. La ricerca artistica di Franco Vaccari (2007), Tre strade per la fotografia (2011), Conversazioni sull’immagine (2013), Casualità e controllo. Fotografia, video e web (2014), Visite brevi (2015), Photo Ad Hoc (2016). Hu published on Enciclopedia Treccani XXI Secolo the essay Realtà e finzione nell’arte contemporanea (2010) and co-curate the final publication forGenerazione critica (2014-2016).